Survey crews in boats look over tanker cars as workers remove damaged tanker cars along the tracks where several CSX tanker cars carrying crude oil derailed and caught fire along the James River near downtown Lynchburg, Va., Thursday, May 1, 2014. 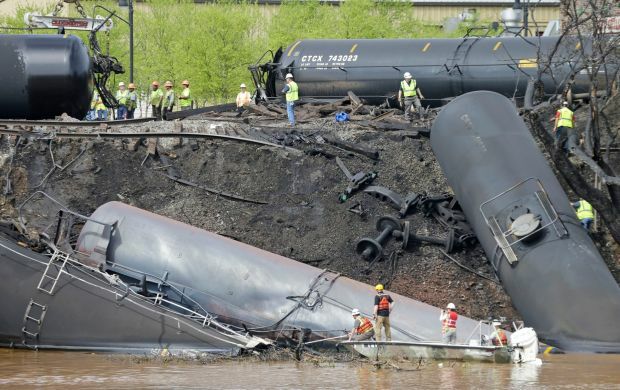 Virginia environmental officials have proposed a $361,000 civil fine against CSX Transportation Inc. as punishment for this 2014 derailment that saw nearly 30,000 gallons of Bakken crude oil dumped in and around the James River. New Orleans The Department of Transportation and the Federal Railway Administration along with the government of Canada have issued new rules for oil tankers on trains, strengthening the tank cars and requiring installation of new brakes in coming years. It is not just because there is so much oil moving from Bakken oil formation underlying Montana, North Dakota, Manitoba and Saskatchewan due to shale oil fracking that they have demanded changes, it’s mainly because Bakken oil is more highly combustible so that derailments and accidents have been like wartime explosions creating destruction, havoc, and deaths when they blow. So, this is all good, right? After interviewing Nancy Nusser from Public Citizen’s oil and coal project in Texas on Wade’s World, it was clear to me that this is only half the battle, if that. 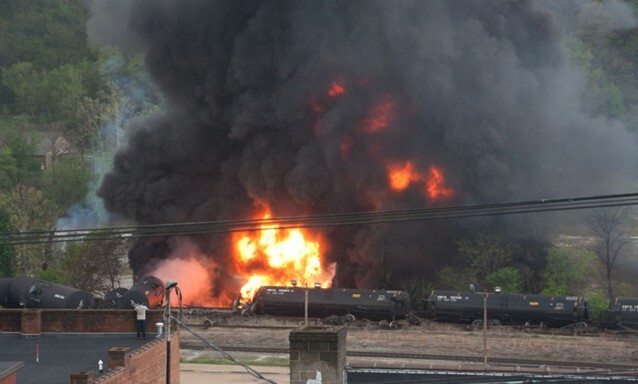 Public Citizen and their allies in Texas have been campaigning relentlessly to try and convince the EPA, the DOT, or anyone else they can get to listen about the dangers of Bakken oil trains as bombs on wheels going through our cities without warning. Forest Ethics makes an interesting case as well. First they argue that, “Oil train derailments are happening pretty much every single month.Aliceville, Alabama; Casselton, North Dakota; Lynchburg, Virginia…the list goes on to include deadly derailments like the July 2013 Quebec disaster, which took the lives of 47 people.” More powerfully they produce a map showing the train routes and note that the blast area on either side of the tracks is 1600 meters recommended for evacuations. The map is a spider web through Texas, Arkansas, and Louisiana of course, but really throughout the entire country given the demand for oil. Public Citizen’s Nusser made the point forcefully using Houston as an example and noting that schools, churches, and hospitals lay along the route of the tracks. They have been demanding that these bomb trains be rerouted outside of dense urban areas to prevent the most catastrophic tragedies. Since the DOT and others are agreeing that the tank cars have to be beefed up, all of us might have thought that at the least since most of the existing tank cars date to 1970 that they would provide some kind of protection for us in the meantime, but the new regulations are all silent on that issue. Living three blocks from train tracks and not far from a switching yard, I was following all of this closely. Speaking of switching yards, working with the Brazos River Bottom Alliance they are also challenging Union Pacific Railways proposal to build a giant rail switching yard in Mumford in that area. Sure, it’s good that they didn’t propose it for downtown Houston, but surprisingly there seems to be no environmental impact statements required for such a project, even given the potential risks. The other key demand ignored by the new standards was the common sense suggestion that the railroads, whether UPR or billionaire Warren Buffet’s Burlington Northern, the other big carrier, alert fire departments and other urban first responders so that they are prepared whenever one of these bomb trains rolls through the city. An early warning system would allow responders to know what the contents were on the train and, though there’s always a hope and prayer that nothing will go awry, such notice would make the response more effective and save lives and property in the event of an accident. Given how much of railroad operations are now computerized, this would have been a trivial matter to implement, but no such luck. Nusser was crystal clear that efforts to engage the railroads directly had been exercises in futility. A little progress is good, but much more needs to be done to keep our cities safe, especially because these train tracks are invariably running through lower income and working neighborhoods where the last thing we need is any more wreck and ruin. This entry was posted in Ideas and Issues and tagged Bakken Oil Trains, environmental issues, Nancy Nusser, Public Citizen, Railways by Wade. Bookmark the permalink.